Before installing the KinesicMouse it is recommended to hook up the Kinect camera to the PC. 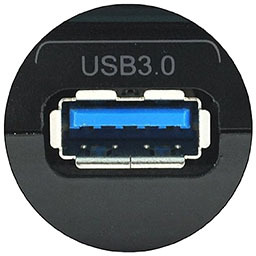 Make sure that it is attached to a USB 3.0 port (these usually have a blue connector). Give this process some time as Windows 8 will download and install the required runtime drivers. After this process finished you can download the KinesicMouse. Follow the instructions there. The camera must maintain a minimum distance of 50cm (19.7 Inch) to your face otherwise depth sensing will fail. So to get best results make sure you are close to the sensor but maintain the minimum required distance. For setting up the camera it is recommended that you display the depth stream inside the KinesicMouse. You can activate the depth stream by: Settings -> System -> Kinect -> Display depth stream. Red pixels in the depth stream indicate that the depth cannot be measured in this position. Ensure that there are no red pixels in the region of your face. If you are wearing glasses or a ventilator there will be small reflective points which is fine. Usually the tracking works best when the camera is located below the level of your eyes. A good place to put the camera may be below your monitor so that it is looking upwards to your face. Your face should be located in the upper half of the camera picture. So turn down the camera so that most of your upper body is visible and your face is completly in the top half of the picture. This is just a recommendation and the optimal positioning may vary from person to person. If your setup does not allow such a placement (e.g. using a laptop) it will work just fine putting the camera on top of the display or on the side. If you have problems with the tracking (red smiley of doom) try a few distances and angles until you get a stable tracking. It is recommended that you install the camera in a way that it is aligned with the rotational axis of your head. So if your head is slightly tilted sideways also tilt the the camera to the same degree. If you are wearing a ventilator face mask a different camera angle might help. Position the camera in way that it has a good view on the parts of your face that are not covered. Check the frequently asked questions for more information on troubleshooting.